You may be able to purchase a “bare” mobile hard disk drive from a computer parts supplier and install it in your laptop. A bare drive is sold as a simple spare part, without all the fancy packaging and extra cost of an item sold in a retail store. You may install the new drive into the original carrier by carefully disassembling it, or you may purchase a carrier from another source. Turn off the laptop and unplug the AC adapter. You never want to tinker with the inner workings of your laptop when it’s plugged in! You want a clean, well-lit, and stable surface. Place a soft cloth or other cushioning material to protect the top of the laptop; you can use almost anything that isn’t metallic or packing an electric charge. In the Toshiba laptop shown here, you would press the release button and carefully lift the battery out. Ground yourself before touching the old drive, and again before opening the bag or box that holds the new drive. You can ground yourself by touching the middle screw on an electrical wall outlet, or by touching a metal pipe. Locate the hard disk drive compartment or bay. Your laptop instruction manual should include a chart showing its position. Unscrew any locking screws that may be holding the drive in place, or unlatch any catches. Set aside the screws in a safe place; make notes on any unusual steps you had to take. Carefully open the carrier that holds the drive and disconnect the mechanism. You need to remove some screws or other holding devices; place the screws in a safe place and make notes about anything unusual you have to do on the reinstallation. Take the old drive out of the carrier and set it aside on a non-static surface. Handle both the old and the new drive with care, holding them only by their sides. Don’t touch the circuit board, and be careful not to damage the connectors for data and power at the back. Avoid putting weight on the top or bottom of the drive. And finally, make sure that you don’t cover the drive’s vent or “breather” hole with tape, a cable, or plastic parts. 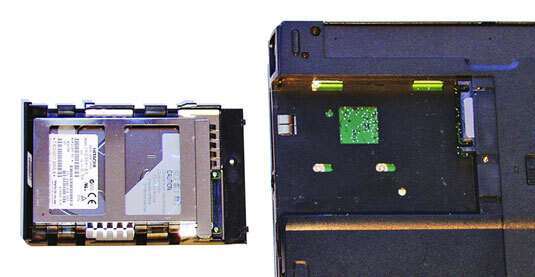 These run from the drive to the external connectors on the outside of the carrier. Install the new drive in the carrier. The new drive has to match the original in size and location of attachment points and connectors.